1. We ship your order by DHL or FedEx. 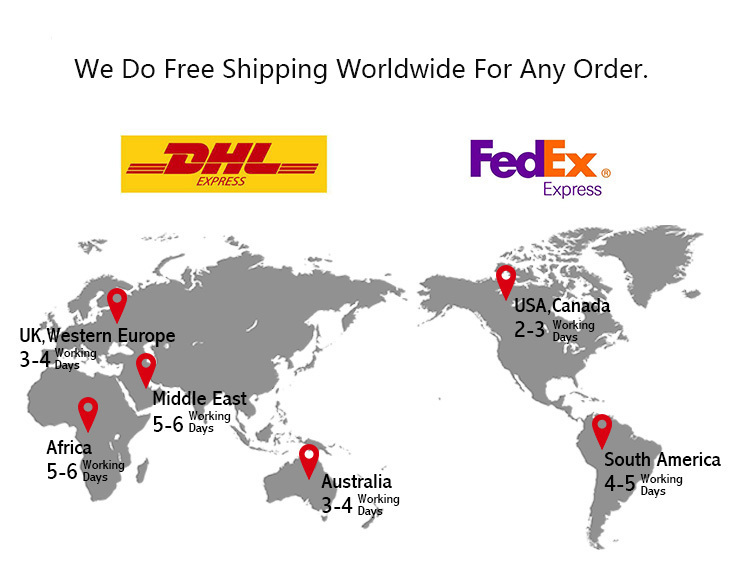 We do Free Shipping for all orders worldwide. 2. If your shipping address is P.O Box or APO/FPO address, we can ship your item by Post Office. But it takes longer time to reach you,about 7-10 business days. avoid tax/duty.If you were charged tax by your local Custom, we would like to help you to go through theCustoms. But the tax will be paid by the buyer. A. Stock item will be sent within 48 hours after payment. Tracking number will be sent via email once the order has been arranged or shipped. So please leave us valid email address. We are more than happy to offer Exchange and Return Service if you dislike the hair you received for any reason. For Exchange, there is no extra fee for the first time exchange. 3. Any customized item cannot be returned. right to refuse the returned package without our permission. 1. Are your Products made of 100% human hair? YES. All of our products are made of 100% human hair. 2. What are Lace Front Wigs? Lace front wigs are manufactured with a thin lace that extends from ear to ear across the hairline. There is extra lace in the front, and you need to cut the lace along the front of the unit. The goal here is to create a new hairline. You will not cut all of the lace, as you will apply adhesive to the lace/your new hairline. Once the unit is applied, you will have on a full hair wig - but the front of the hair wig will not be like a regular wig. The wig will appear that it is growing directly from your head. 3. How much Parting room for the lace front wig? There is about 3 inches parting room in the front . 4. What are Full Lace Wigs? Full lace wigs come with a base that is made entirely of lace. The lace material essentially covers the whole head even all the way to the back. Because of this, full lace wigs are more versatile because you can also style them into up-dos, braids, and many other hairstyle that are not possible with a front lace wig such as a high ponytail. It just gives you more natural flexibility. 5. What’s Natural Hairline & Widow Peak Hairline? The natural hairline is straight hairline, and it grows out of the scalp straightly above forehead. The Widow’s peak hairline is ‘V’ shape. The stock unit comes with Natural Hairline. No, it’s free of charge. The stock units all have baby hair around the perimeter. 7. Can I color the hair? But we highly recommend you having your hairdresser dye the hair because they are more professional and you could get the color you want. If you really want to color it by yourself or can’t get to a salon, you should use a good quality hair dye and test a small sample at first, so that you could see the result before you decided! 8.How many bundles do I need? Normally 3 bundles will be enough for a full head. But if your head size is larger than the standard or you want to make much fuller look, you can order one more bundle. 9. Why are my hair extensions getting tangled? Your hair extensions can be tangled due to being to dryness, oil & dirt build-up. Salt-water, chlorine and not comb (wide tooth comb) out your hair daily. Make sure to wash & condition your hair at least once a week, twice a week is better. Use hydrating drops or consult your stylist for more help. 10. How long will I receive the order after payment? Normally it takes 1-3 business days to process your order, and another 3-5 days to reach you by Fedex, UPS or DHL. 11. What’s the most convenience payment method? 12. How to place the order online? 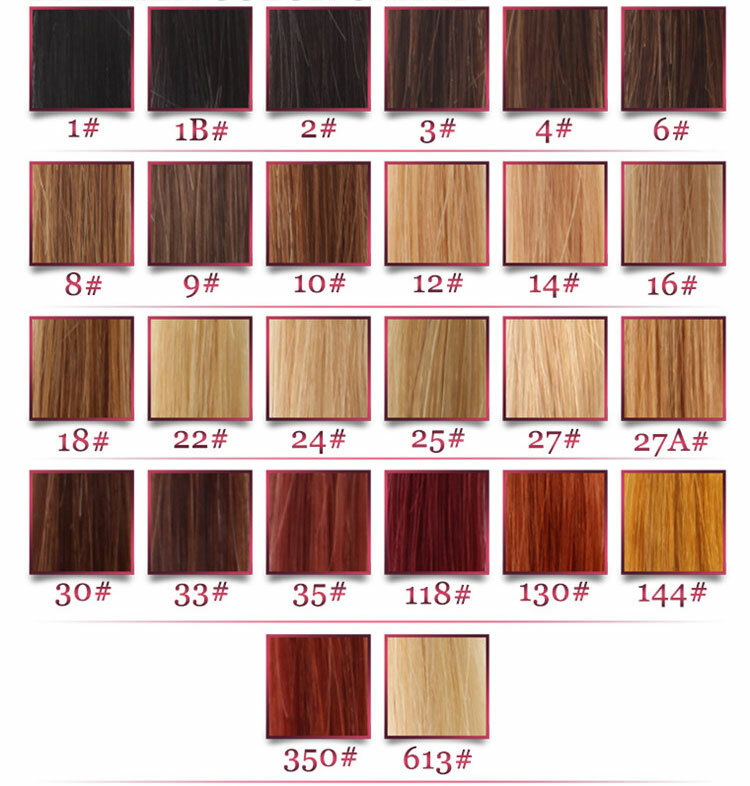 You can find the item you want to purchase on our website and select all the information ( such as hair length, hair color , cap construction and so on) below the option. Then you can put it into your shopping cart and finish the payment with Paypal or Western Union. 13. How to track your order after shipping out? You can track the shipping information on DHL & FedEx website with tracking number.